right to bear arms under the pretext of Marshall Law. 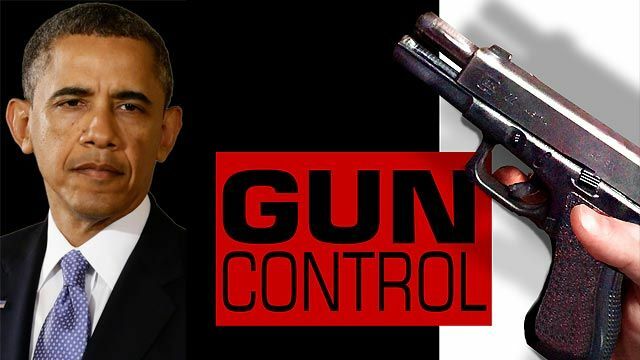 If Barack Obama has one top priority mission during his final year in office, which is much higher on his “To Do” list than any other, it is to strip Americans of their 2nd Amendment right to possess firearms. Make no mistake about it, there will be an all-out assault on the 2nd Amendment for the next 13 months. 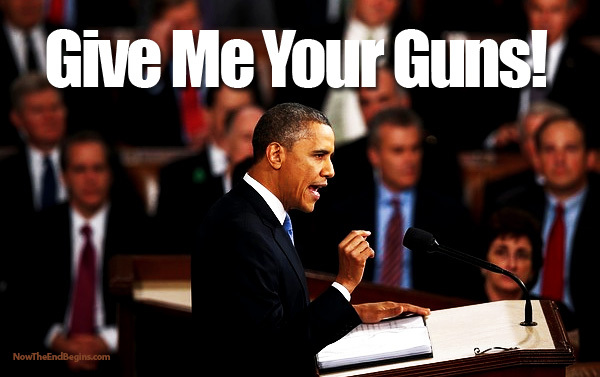 Call it the last and final push to once and for all strip Americans of their constitutional right to gun ownership. It may not come all at once, as the stealthy approach of Obama’s handlers has been patiently incremental. In fact, his masters have used each of his 7 years in office to methodically peck away at society’s willingness to let firearm possession prevail—24/7. No matter how many gun-related atrocities are required to remove America’s guns, the ruling elites are determined to orchestrate one fake shooting after another, no matter how fraudulent and stupid they may look. Despite the reality that most of these mass shootings are obvious government black operations, their strategy is slow and sure, forever wearing away at American acceptance (and tolerance) of its longstanding and traditional gun culture. Was The Charleston Church Shooting Yet Another False Flag Operation (and Distraction Event) To Take Away Guns? Truly, the mass shootings and shocking shootouts, schools murders and mall shoot-ups just won’t quit. Not only will the pace of these mass murders not slacken, in all likelihood they will only increase in number and intensity since Obama was explicitly chosen as their man to remove guns from the street. Why else did they choose a half white, half black constitutional lawyer except to do the dubious honors of taking away America’s guns? He’s the only one who could possibly get away with it; that is, if he makes it out of D.C. without being ly_ched! What’s the key point here? Obama was selected as POTUS for two primary reasons. Yes, they chose him to pass the unmitigated legislative disaster known Obamacare, as well as to put his presidential stamp onto the unconstitutional Gay Marriage ruling by the SCOTUS. However, these two ‘successes’ legislative and judicial, respectively, are quite secondary to his primary missions as prez. Without question, his highest domestic priority is to practically — not legislatively — nullify the 2nd Amendment anyway he can. By erecting so many new barriers to gun ownership and ammo purchases, or by issuing unlawful executive orders, or by demanding illegal background checks, or by somehow issuing mental health criteria as a requirement to gun ownership, etc. he possesses many tools and techniques to weaken the Second Amendment. Incidentally, his most important foreign policy mission was to restart the Cold War with Russia, which he accomplished with an extraordinary degree of prevarication and treachery. He did this by arming (with guns) the neo-Nazis in the Ukraine, unlawfully supplying terrorist organizations in Syria (e.g. ISIS and Al Nusra) with weapons (aka guns). Even the murder of U.S. Ambassador J. Christopher Stevens during the attack on the American diplomatic compound in Benghazi was really all about CIA-coordinated gun-running to the rebels who were paid by the USA to overthrow President Muammar Gaddafi. What else should be expected from a Nobel Peace Prize winner?! As a stone-cold, full-fledged Manchurian Candidate, Obama has been programmed to accomplish these 2 essential missions. 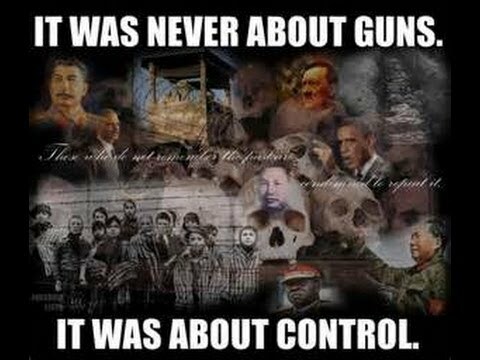 Foisting total gun control on the United States of America has always been a primary mission of the globalist cabal that is determined to turn the nation into a slave plantation. Obama is clearly their man to take the credit and/or blame for putting the final nail in the coffin of the American Republic — “land of the free and the home of the brave”. The so-called terrorist-perpetrated San Bernardino mass shooting is just one more of many patently false flag and thoroughly fake black operations designed to shock and awe the U.S. citizenry. Surely there must be a threshold of tolerance beyond which the American people will gladly give up their guns, as well as the very right to possess firearms. So goes the thinking of the ruling elites who really do fear for their lives after all that they have plundered from foreign lands and pillaged on the domestic front through legalized fleecing. The real problem with their sheer desperation is that the NWO global cabal is already way behind schedule with regard to legislated gun control. The free flow of relevant gun control information and data on the internet has significantly slowed down their plans for the confiscation of all guns. The World Wide Web has especially curtailed their ability to repeal the 2nd Amendment. That was their actual goal at one time, but it can no longer be accomplished as too many patriots — both gun owners and those who choose not to own — are onto their game. Nevertheless, these United States of America remain an extremely dangerous place because of the incessant government plots afoot to stage one mass shooting after another. Unwittingly, the government agents are providing a HUGE justification for the maintenance of a healthy and robust 2nd Amendment. After all, it’s downright dangerous out there, not too unlike the wild, wild West was once upon a time. You never know who or where or how the next mass shooting is going to take place. And it’s the G-men who are behind them all, so how can the American people possibly consider giving up their guns, especially when they are under such violent assault BY THEIR OWN GOVERNMENT? What is not being asserted here is the degree of authenticity of these various shootings. All that can be said with certainty is that they are staging events which are then conveyed as real mass shootings through the mainstream media (MSM). How many of these fabricated shooting events actually kill and injure people is impossible to say. However, it is probably safe to assume that, except for Sandy Hook — where clearly nobody died — some of the other recent mass murders may have actually taken place; albeit, with G-men or their proxies pulling the triggers. What’s the crucial point? It’s dangerous out there no matter what’s really going on, because people are in fact disappearing after the supposed shootings, be they genuine or bogus. Because it is quite impossible to fake so many disappearances, it is therefore quite dangerous being out and about in public places. Public spaces and events are simply too exposed and are particularly attractive targets for the government to use to implement their “Shock and Awe” agenda. Which again speaks directly to the dire need to possess firearms; that being to protect oneself from either from the real crazies or criminals, or from the government forces who control them and from the G-men who are paid triggermen. 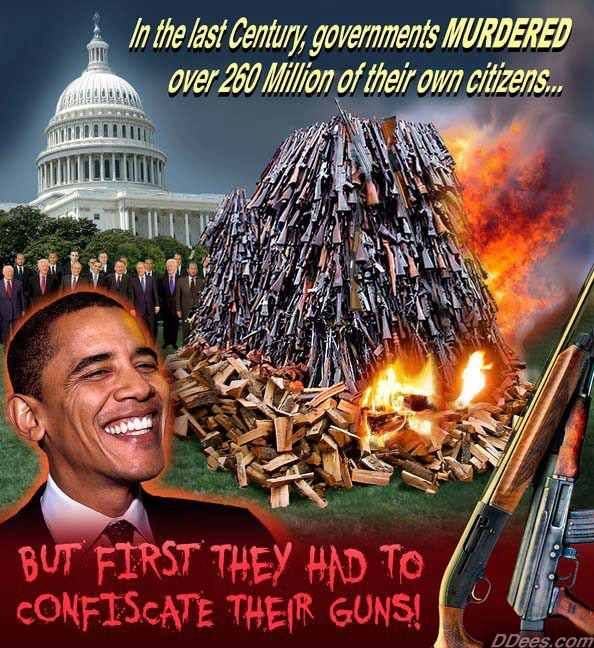 Why is the NWO agenda to confiscate all guns so critical to the success of their misguided scheme of a One World Government? There is really nothing else but American gun ownership (and firearm possession) that prevents the cabal from running their tyranny across the planet in the form of a One World Government. Whereas the United States is in actuality the military arm of the New World Order, it is therefore critical for the U.S. citizenry to be compliant and cooperative with respect to all manner of military ventures and foreign conquests. Toward that end, the World Shadow Government (WSG) cannot risk the threat that a true representative American government might be elected. Hence, the WSG contrives one false flag operation after another to keep the citizenry in the state of constant fear and anxiety so that they will slowly give up their rights. In this way the electorate will ALWAYS vote for the lesser of the two evils who clearly represents the interests of the NWO globalists. With each false flag terror attack around the globe citizenries have willingly ceded their hard-earned rights and liberties in the interest of guaranteeing a thoroughly fraudulent form of ‘national security’. The WSG has been quite successful in taking away the guns from the people in countries throughout the European Union as well as Australia, and are determined to implement a global ban on guns under the authority of the United Nations. The bottom line with respect to gun ownership is that a citizenry that has no access to guns and ammunition poses no threat to a despotic government. The more tyrannical the leadership, the more determined they always are to remove any legal right to firearm possession. The Obama Administration, being the most lawless and autocratic in U.S. history, was the obvious choice to divest Americans of their guns. Many of the pseudo-liberals who staff the current Executive Branch are actually communists at heart masquerading as Obama socialists who cannot wait to impose their brand of godless and corrupt political philosophy on the nation. In reality it has been well over 100 years of creeping government control which has found its perfect advocate in the presidency of Barack Obama. The national security state has experienced relatively little resistance because of the way that Obama was used to effectively co-opt so many governmental institutions and public corporations, NGOs and private foundations, universities and research organizations, think tanks and brain trusts. He was especially successful at capturing a great majority of those Americans living in the lower socio-economic classes. The regular transfer payments from the “welfare state” to those who have been made jobless or permanently unemployed secures a loyalty to Obama’s cause that has no competition. Virtually every domestic policy initiative that has been undertaken by the Obama Administration has this as its ultimate goal. Obamacare is, of course, the poster child for woefully failed government intervention in the marketplace. The ACA (Affordable Healthcare Act) is a government program that promised one thing but ended up delivering something altogether different. Not only has it destroyed the institutional arrangements of the American healthcare delivery system, it has driven up healthcare cost from levels that were already unsustainable. The deceitful strategy and unparalleled stealth that was employed to enact Obamacare has since been tried time and again against the opposition of the Republican Party. It is for this reason that Obama has cried racism when in fact it is he who is the racist. Forever stoking the embers of racial tensions and religious differences, he has cultivated an unprecedented environment of hatred and division throughout America. In this way has his Administration been responsible for producing a level of societal violence and police brutality that could serve as a false pretext for extraordinary government intervention, or worse, Marshall Law. This is their master plan: divide and conquer each and every demographic within American society. By driving wedge issues deep within the body politic, it is planned that the American people will be too spent to fight the government that really terrorizes them. This strategy then utilizes a whole load of tactics which pits father against son, daughter against mother, white against black, boss against employee, neighbor against neighbor, man against woman, heterosexual against homosexual, rich against poor, etc. This classic communist scheme for “divide and rule” employs the very people themselves to do all the dirty work. In this fashion has the U.S. Federal Government been setting up the country so that ultimately it will be a majority of American people who demand gun control. That’s where Obama is really going with this. After a critical number of colleges and universities experience mass shootings — fake or otherwise — college students will be sufficiently softened up so that they will one day say enough is enough. At that point protests and demonstrations might even erupt on college campuses instigated by government-controlled agent provocateurs. Their (aka TPTB) Hegelian Dialectic strategy, as well as “divide and rule” tactics, revolve around the key social engineering dynamic known as manufactured consent. They know they cannot use Obama to take the guns away from the law-abiding citizens without the consent of a solid majority of Americans. Therefore, they are now working triple time to manufacture the necessary consent. TPTB are obsessed with their self-imposed deadlines with only a year left of their ever-obedient puppet president to do their bidding. Once Obama leaves office, the political climate will change significantly, regardless of who the next president is. Hence, the campus shootings will continue and probably intensify for the foreseeable future. It is therefore highly advisable that everyone on campus be extra vigilant. Do you now see where this is all going? 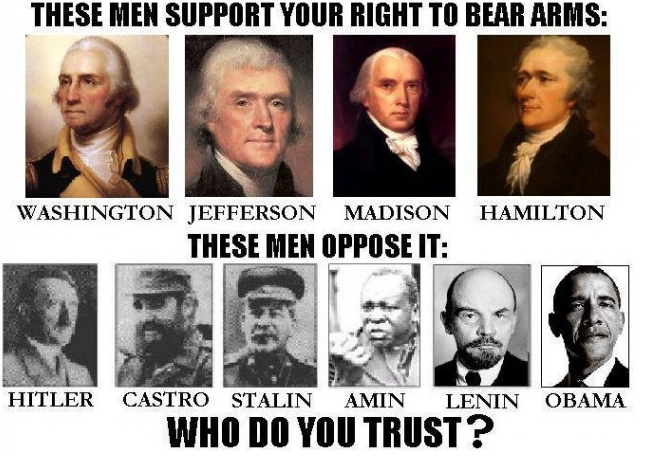 Caveat: If Hillary Clinton is elected president, the pressure exerted by the globalist cabal to take away the guns will surely not wane; although, the men of America will not take too kindly to being divested of their firearms by a ‘woman’ president. 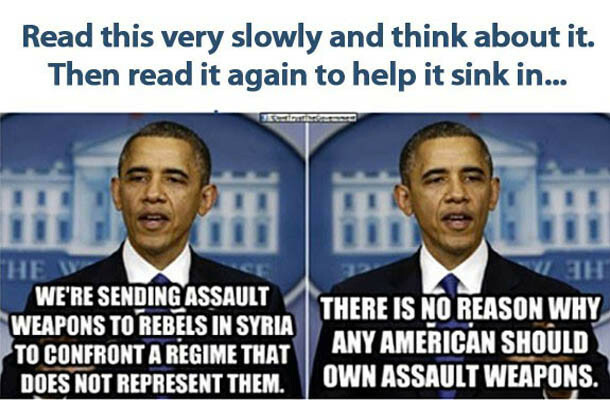 That’s precisely why Obama was chosen for the odious job of taking away America’s guns.